Harajuku trio stepping out on the street in mixed casual streetwear looks. Harajuku guy in colorful casual streetwear style. Japanese students sporting colorful kawaii looks while out and about on the street in Harajuku. Harajuku teen wearing a zip up jacket, corduroy pants, white sneakers, purple backpack and cap, and glasses. Harajuku student in colorful retro fashion wearing a pink jacket, a purple t-shirt, yellow shorts, knee high socks, white sneakers, a backpack, badges, and a My Pet Monster plush toy. Harajuku teens in purple sweater fashion with pink denim pants, cuffed jeans, black sneakers, platform sneakers, zebra print backpack and a round chain bag. 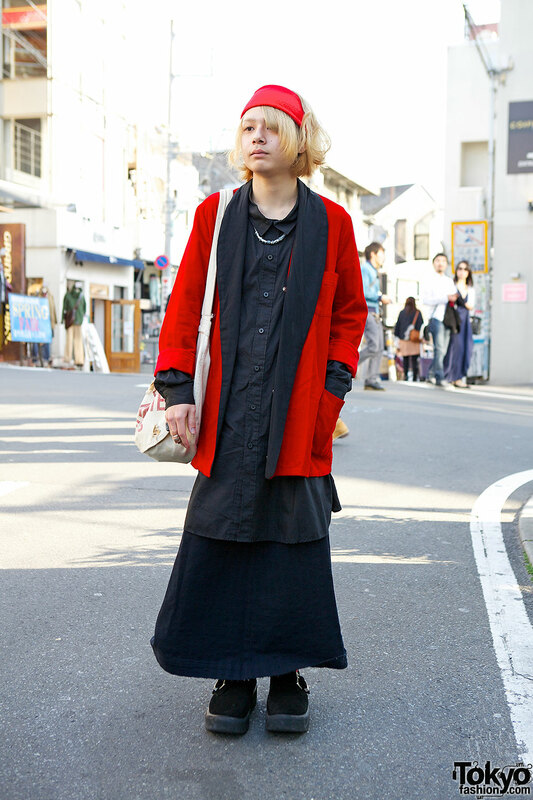 Harajuku guy in a red and black layered outfit with maxi skirt and headband.